This Friday (October 30th), WHITECHAPEL will unleash their new live CD/DVD set, The Brotherhood Of The Blade, via Metal Blade Records. Featuring an exclusive documentary (in addition to a live performance shot in Knoxville, TN), The Brotherhood Of The Blade stands as a glimpse into the sextet's world, into each member's outlook, and the changes they've experienced over the past near-decade on the road. Shot and directed by Mathis Arnell for Naughty Mantis, with live show audio recording, mixing, and mastering by Audiohammer's Mark Lewis, this release is an audio/visual apex that fans won't want to miss. For a preview of The Brotherhood Of The Blade, check out the debut of "The Saw Is the Law" live video on KNAC.COM right HERE. To view the trailer for The Brotherhood Of The Blade and to reserve your copy of the CD/DVD, GO HERE. Since forming in 2006, WHITECHAPEL has toured extensively around the globe, amassing a level of success of which most only dream. Most recently, their 2014 album, Our Endless War, earned them the bragging rights as one of the heaviest groups to ever crack the Billboard Top 10, plus a #1 spot on the Billboard Hard Rock chart. With each new release, the band takes their career to new heights. 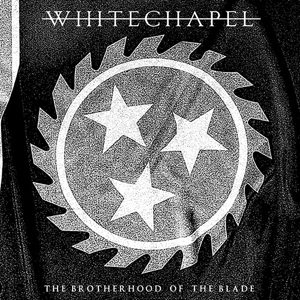 See below for the complete track-listing for WHITECHAPEL's latest offering, The Brotherhood Of The Blade. After The Brotherhood Of The Blade's release, WHITECHAPEL will be touring the USA with label-mates CULTURE KILLER and Australia's PSYCROPTIC. See below for all dates!